After Delighting The World For 45 Years, Our Great Tasting Prawns are here! 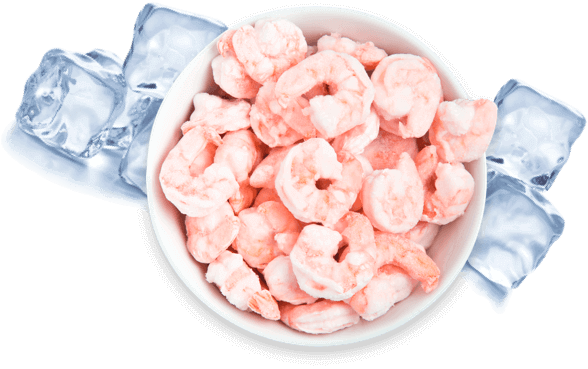 Prawn lovers around the world have fallen in love with our Soft, Juicy and Freshly Frozen Prawns. They’re here to win you over. 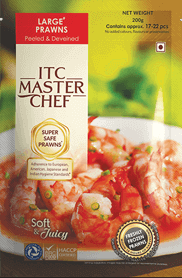 ITC Master Chef prawns are Individually Quick Frozen (IQF) within 15 hours of catch. Freezing prawns to temperatures far below zero arrests bio-chemical reactions and locks in the freshness. Prawns are one of the most versatile foods. We have picked 4 sizes that’ll unlock an astounding range of culinary possibilities - from quick and simple daily preparations to serious impression makers for special occasions. So go ahead and take your pick from our varieties of soft and juicy prawns. 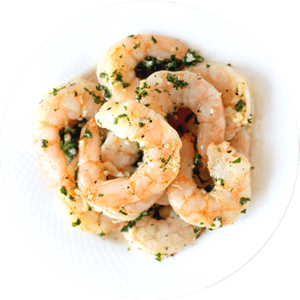 Great for gravy based recipes, these prawns can also be used for grilled, stir-fried and sautéed preparations with a mix of other ingredients. Also they blend in easily with the dish, while retaining their taste as the hero ingredient. Use these to make a Classic Prawns Cocktail or Prawn Fried Rice. Each 200g pack has approx. 35-45 of Medium Prawns. These prawns are suited not just for gravy based dishes but also for dry, stir-fried, sautéed, grilled and barbeque preparations. 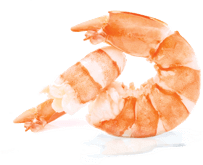 Large prawns are perfect for Prawn Croquettes or Prawn Terrines. They can also be used for a variety of Asian recipes. Each 200g pack has approx. 17-22 of Large Prawns. Serve Super Large prawns whole with mayonnaise or aioli to show off their beautiful dramatic colour. You can also add them to soups – their firm flesh holds together well. Their size makes them ideal for starters. You can cook them on barbeque or use them to make Garlic Prawns. Each 200g pack has approx. 12-14 of Super Large Prawns. Best for dry preparations, these prawns can perfectly pull off being the hero of not just the dish, but the entire meal. Leave these prawns whole, rather than chopping them, to make the most of their attractive appearance. Serve them cold with a delicious dipping sauce or in a seafood salad. Each 200g pack has approx. 10-11 of Super Large Prawns. At ITC Master Chef, we want to bring the excitement of cooking back into the Indian Kitchen by bringing you the choicest ingredients. And this time we’ve brought you the world’s favourite seafood. 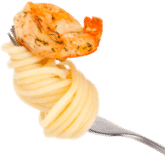 We have been serving our prawns to the most discerning customers in as many as 40 countries. 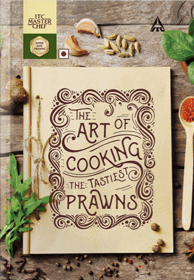 So go get yourself a pack of ITC Master Chef prawns today, and let’s dive right in to a sea of culinary adventure! Our prawns are not just lip-smackingly good, but also bigger in size when compared to other frozen prawns available in the market. 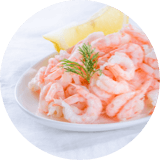 ITC Master Chef prawns are Individually Quick Frozen (IQF) to -18C within 15 hours of harvest while they are fresh. This locks in their freshness and locks out decay. ITC undertakes 243 different tests to ensure you get high quality and safe prawns. Thanks to state of the art facilities, our prawns adhere to European, American, Japanese and Indian Hygiene standards. *Complies with the Hygiene requirement as per 'Executive Instructions for Approval and Monitoring of Fish & Fishery Products for Export, Manufacturing units are HACCP Certified. 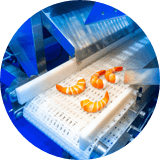 Freezing of prawns to temperatures below zero locks in the freshness and locks out the decay. Thus the prawns stay fresh without any added flavours or preservatives. 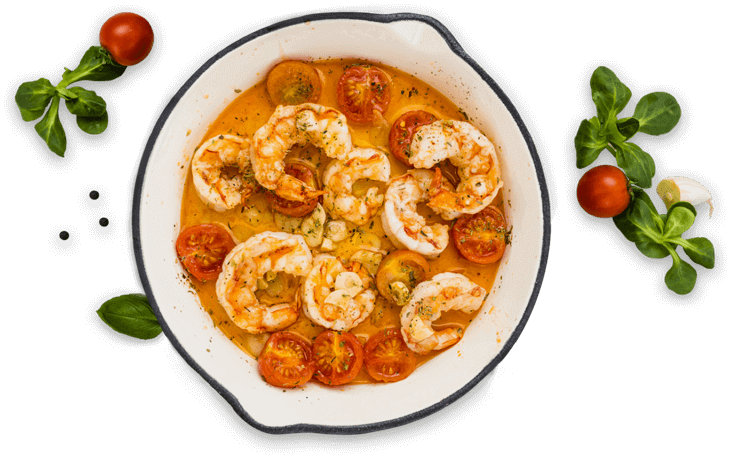 When you use our prawns, frozen quickly after harvest, you de-frost soft and juicy prawns at their peak freshness when cooking. This makes ITC Master Chef prawns far better than "fresh" prawns. 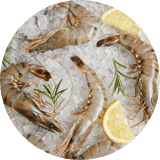 ITC Master Chef prawns are Individually Quick Frozen (IQF) within 15 hours of catch. Freezing prawns to temperatures far below zero arrests bio-chemical reactions and locks in the freshness. On de-frosting you get Soft & Juicy prawns at their peak freshness. 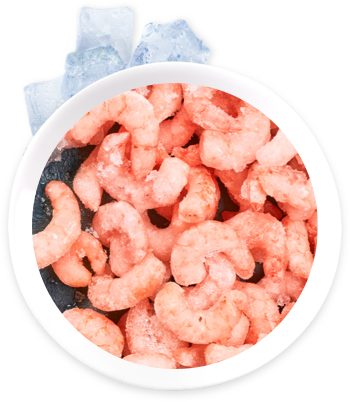 Unlike block freezing, IQF prevents the prawns from clumping together on thawing. This prevents the delicate prawn meat from bruising. Freezing prawns to temperatures far below zero arrests bio- chemical reactions that result in decay. At ITC, we have gone to great lengths to make our prawns ‘Super Safe’. We take meticulous care in cleaning and deveining our prawns while ensuring that they stay fresh and retain their taste without the use of any flavours or preservatives. That’s probably why our prawns are trusted and loved worldwide. Our testing procedure consists of 243 individual tests done to ensure that our prawns are absolutely safe to eat. 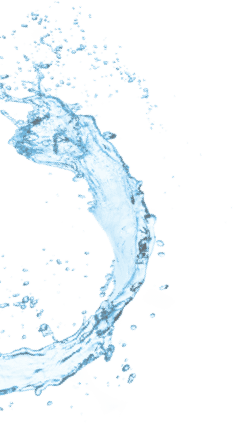 While that’s our own testing process, our manufacturing facilities also have international accreditations to ensure that the quality of our prawns is approved by global food safety authorities such as the Best Aquaculture Practices (BAP), British Retail Consortium (BRC) and Hazard Analysis and Critical Control Points (HACCP). We’ve been exporting our prawns to countries around the world since 1972. In short, ITC Master Chef prawns are ‘Super Safe’- you can take our word for it. * Complies with the Hygiene requirement as per ‘Executive Instructions for Approval and Monitoring of Fish & Fishery Products for Export, Manufacturing units are HACCP Certified. Wondering where we get our soft & juicy prawns from. Let us show you. Both fresh & frozen prawns start off from water, it’s the process they go through from farm to fork that matters. 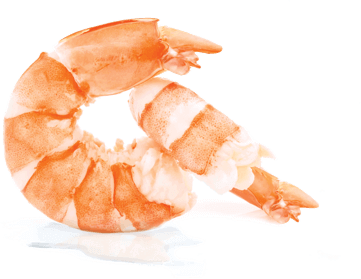 Fresh prawns are typically kept in ice (made of dirty water) for days together which doesn't stop the decay, hence fresh prawns are not actually 'fresh'. Also, their nutritional value gets lost. 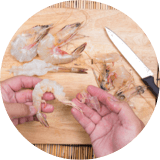 Before freezing, prawns are properly cleaned with water multiple times, leaving no chance of contamination. Freezing of prawns locks in freshness and locks out decay. 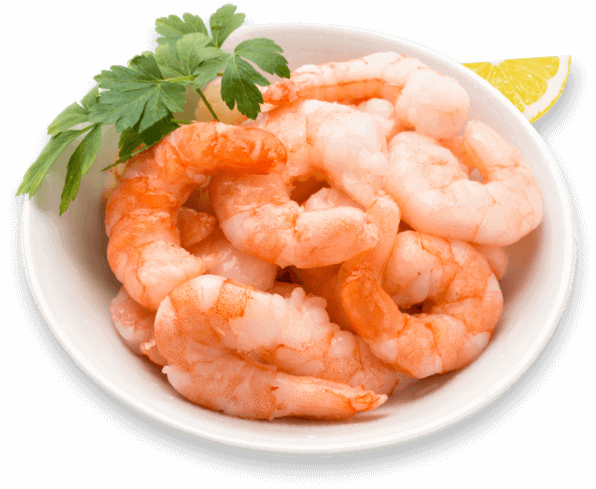 Fresh prawns are available in whole form thus need the efforts of removing the shell, head, tail & vein before cooking. 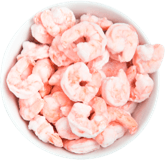 Frozen prawns are properly peeled & deveined, thus saving the inconvenience. Fresh prawns do not go through any safety tests. Frozen prawns undergo multiple safety tests as per regulatory mandates. 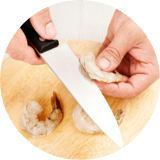 Fresh prawns need to be peeled & deveined, hence lose 50% of the purchased weight. 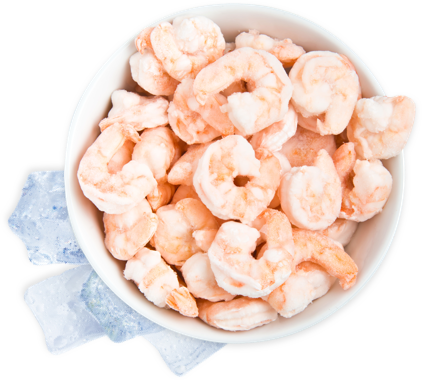 Frozen prawns contain only meat as effective yield. Prawns are possibly the most passionately loved seafood in the world. While they are delicious to eat, they are also surprisingly simple to cook. A word of caution though- prawn meat is soft and delicate, and there are more ways of going wrong with prawn than there are with traditional meats. So here are few tips that ensure no matter what dish you cook, your prawns always taste great. How should you thaw frozen prawns? Keep the polybag in a bowl of water (at room temperature water) for 20 minutes. For your convenience, we’ve put these instructions on the back of the pack as well. 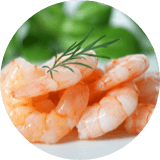 Once thawed, the prawns should be used as quickly as possible, and we strongly advise against re-freezing them. How long do prawns need to marinate? Marination time depends on the kind of marinade. Acidic marinades such lemon juice (citrus flavours go well with prawns) are best for marination up to 30 minutes. Prolonging this can break down the delicate meat, making it mushy and less firm. Non-acidic marinades (such as olive oil, herbs, garlic etc) are known take longer, up to an hour, to soak in. Marination is best done inside the fridge. Prawns meat is one of the fastest to get flavoured, unlike, say, mutton. Light seasoning can work wonders on prawns as they retain their mild oceanic flavours, while quickly absorbing flavours that complement. 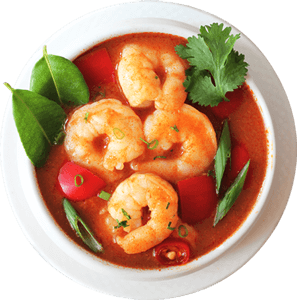 Since prawn meat is delicate, it is advisable to be careful when seasoning with chili and pepper to avoid overpowering the flavour of prawns. What cooking procedures work well with prawns? While cooking a curry it is important to add prawns in the very end rather than during cooking of masala. When cooking prawns on the BBQ it’s best to wrap them in, as the intense direct heat can damage the flesh if not protected. While poaching, cook whole prawns in simmering water (below boiling point) for 1-3 minutes and then stop the cooking process by placing in the ice water bath once cooked. How long do prawns take to cook? While cooking prawns is easy, overcooking them is easier still- so be watchful! 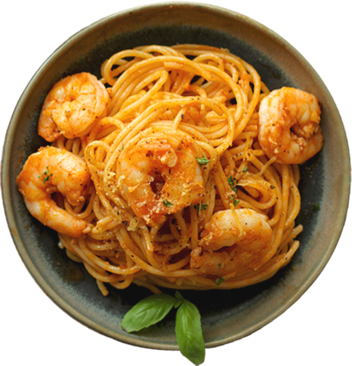 It is advisable to cook prawns for short durations as cooking for long durations tend to make them not only tough and hard to chew but also to lose their nutritional value. Also it is best to cook prawns just before consumption rather than precook a few hours ahead. How much heat do prawns need to cook? It is advisable to apply gentle heat to prawns while cooking as harsh heat tends to make them tough from outside and leave them undercooked inside. 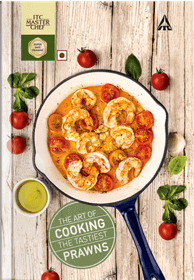 What oil is best for prawns? 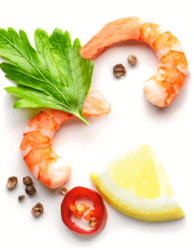 Prawns take well to cooking with flavourful oils such as olive oil and mustard oil as compared to refined oil. How do I know if my prawns are cooked? Colour: Well-cooked prawns turn a light shade of reddish pink. While their tails turn into a strong shade of dark pinkish orange, the flesh remains comparatively whiter, with a light translucent haze. Fully opaque white prawns are probably overcooked. What is the right number of prawns per serving? For prawn lovers, more is always merrier! That being said, smaller the size, higher the number per serving. But it all depends on the kind of dish you want to make. Do frozen prawns usually taste hard and rubbery? All prawns tend to turn hard and rubbery when overcooked. 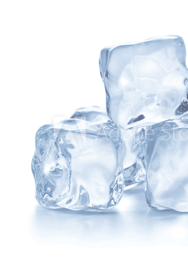 This has nothing to do when them being frozen. In fact, prawns (and any other seafood for that matter) stay fresh when frozen, and are very tender when thawed. If cooked well, they’re turn out soft and juicy, with just the slightest crunch when you bite into them. 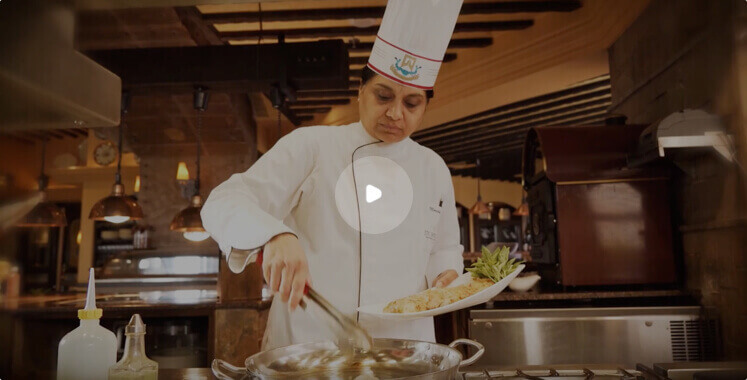 Crafted by our ITC Master Chefs, we bring you a choice of recipes to incite your taste buds. What are Super Safe Prawns? 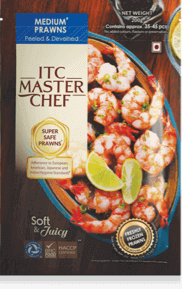 ‘Super Safe’ is a term we use to describe ITC Master Chef prawns. 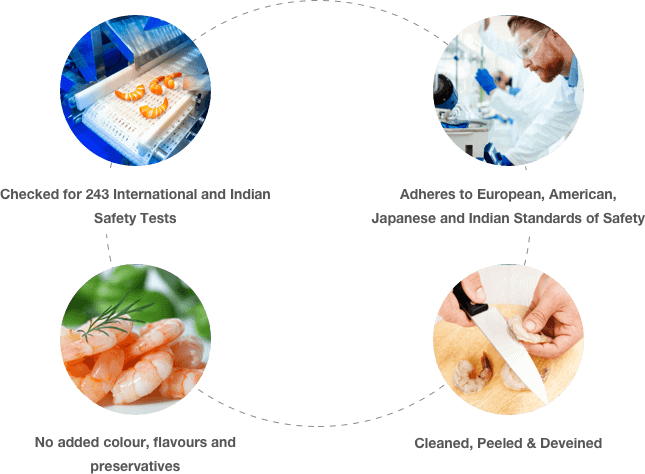 Not only are our prawns rigorously tested and certified in India, they also comply with hygiene standards of Europe, USA, Japan and India. What is the most important thing I need to know about eating prawns? Prawns are one of the most loved seafood on the planet. But some people are allergic to them. If you’ve never had prawns, we recommend you seek advice before you do. I really like prawns, but have never cooked them at home. Should I try? 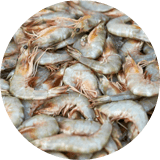 To avoid hassle of buying prawns, and then cleaning and deveining them in a way that’s safe and hygienic, many prawn lovers eat prawns only at restaurants. ITC Master Chef prawns are cleaned, deveined and ready to cook. They’re designed to be conveniently cooked at home. Our website is loaded with great recipes that can get you started in no time! I’ve heard prawns are tricky to cook. Is there something I should know before I cook them? While Prawns are delicious to eat, they are also surprisingly simple to cook. But we recommend reading these expert cooking tips first, so you’ll never go wrong with them. What size of prawns should I buy? We recommend choosing prawns basis what you’re inspired to cook. We have picked 4 sizes that’ll unlock an astounding range of culinary possibilities for you. So go ahead and take your pick from our varieties of soft and juicy prawns. You can find more details here/in our Product Range section. 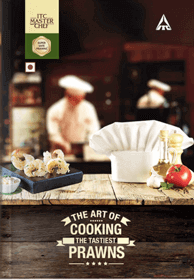 Why should I buy ITC Master Chef Prawns? ITC has been exporting prawns for the last 45 years. Over this period, we have perfected the art of hygienically transforming prawns from their natural state to being ready to cook. 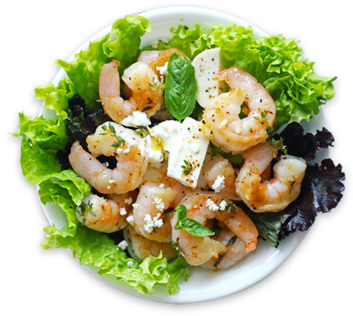 Our prawns stay fresh and are super safe, certified by various national and international food safety bodies. 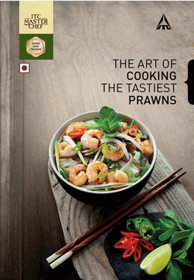 But more importantly, our prawns are loved and trusted by chefs in top hotels in India and abroad. 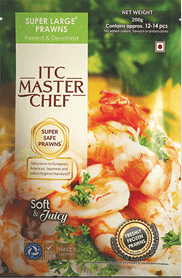 Where can I buy ITC Master Chef prawns? 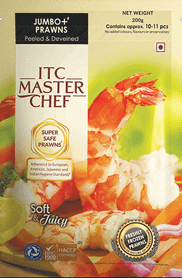 ITC Master Chef Prawns are presently available in Delhi (NCR) and Hyderabad in all major grocery retail outlets.